The Boeing/Insitu ScanEagle UAS has versatile talents, including the capability to be deployed from a towable Mark 4 launcher. 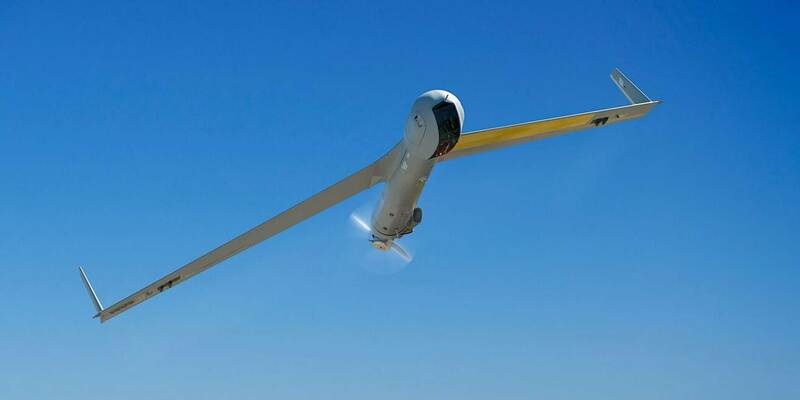 The Boeing/Insitu ScanEagle fixed-wing UAS system continues to gain new features and capabilities as its popularity increases with both military and civilian users. The Singapore Navy has deployed it from its Victory class corvettes at sea, and it has also been used by the UK Royal Navy. The U.S. Navy has flown it since 2005, and worldwide it is in use by more than two dozen countries. ScanEagle has a wingspan of 3.1 meters (10.2 feet), a length of 1.6 meters (5.3 feet), a maximum takeoff weight of 23 kilograms (50.7 pounds) and a typical cruise speed of 50 to 60 knots. Endurance can exceed 24 hours. Power comes from a two-stroke, aft-mounted engine that runs on either JP-5, JP 8 or high-octane unleaded C-10 gasoline. Range from its positive controller varies from 80 to 150 km (43.2 to 90 nautical miles) and service ceiling is 19,500 feet. The turret can accommodate electro-optical and infrared sensors and cameras including EO, EO900 and MWIR (mid-wavelength infrared) dual imager. The video datalink can be analog or digital encrypted and the C2 datalink can be either encrypted or unencrypted. The ScanEagle system can include a trailer-mounted, runway-independent Mark 4 launcher for ground-launched operations, a compact Mark 4 launcher for maritime and multi-mission operations, a single-operator ground control workstation, and the SkyHook runway-independent recovery system. Approximate system cost is S$4.61 million to S$6.59 million (US$3.5 to $5 million) depending on supporting hardware and sensor packages ordered. A typical system includes three to four air vehicles. “All night or high-end sensors; you’re at the top of that range. A more baseline system you’re closer to the bottom. In many ways it’s akin to buying a new car; the base model is at one end of the scale, but if you add all the high-end options, the price increases,” said Andrew Duggan, managing director of Insitu Pacific. At any given time, Duggan estimated that there were between five and 15 ScanEagle systems deployed in the region. Singapore has been operating the system since 2011 and its navy has been trained to support the system indigenously. Insitu can also support ScanEagle in the region from its base in Australia. ScanEagles equipped with Sentient’s ViDAR (visual detection and ranging) system have proved a powerful maritime surveillance tool. Lighter and more compact than radar, ViDAR is an airborne persistent wide area maritime search system that autonomously detects objects on the ocean surface, provides the operator with a detailed image of objects, and provides more than 80 times the area coverage of existing EO/IR systems. It consists of single or multiple nine-megapixel secondary sensor(s) and onboard automation software designed to automatically detect objects on the ocean in real time. The nine-megapixel sensors operate akin to an airborne radar, but in the visual domain, by sending objects detected to the operator for further analysis by the aircraft’s primary sensor. On ScanEagle, it provides continuous scans in a 180-degree arc ahead of the vehicle to a range of 37 km (20 nm), and can cover more than 45,824 sq km (13,360 sq nm) of ocean in 12 hours at 60 knots. ViDAR autonomously detects any object on the surface of the ocean, providing the ground control station with an image and location coordinate of each object detected in real time. Selection of one of these images automatically cross-cues the primary sensor to objects of interest for closer inspection. ScanEagle with ViDAR has been successfully flown by the U.S. Coast Guard (USCG) and UK Royal Navy, the latter in 2016 as part of its “Unmanned Warrior” exercise. A ScanEagle operated by the USCG aboard the cutter Stratton in the eastern Pacific assisted in the interdiction and single seizure of S$72.5 million (US$55 million) worth of illegal drugs and its traffickers in 2017. During the six-week deployment aboard the Stratton, ScanEagle flew 39 sorties for a total of 279 hours, including one operation where the aircraft provided persistent surveillance for 22.7 flight hours in a 24-hour period. ScanEagle was equipped with multiple sensors including electro-optic, thermal, and telescope cameras that delivered a range of aerial imagery to the ship. Besides drug interdiction, ScanEagle also has demonstrated capabilities to enhance monitoring of commercial fisheries and border protection. ScanEagle is also increasing in popularity for civil and parapublic operations, according to Duggan. Late last year Insitu announced a contract with Shell QGC in Queensland (Australia) to use the system to monitor and inspect infrastructure in a patrol area encompassing 1.73 million acres in the massive Surat Basin gas fields, potentially reducing travel by ground crews of up to 800,000 km/year (432,000 nm/year). The sensor packs used on ScanEagle for this application enable collected data to be automatically processed and analyzed in near real-time with actionable information (including equipment checklists and operational status) before being delivered directly to field operators and supervisors, and management staff in the headquarters facility in Brisbane. While the average ground crew can inspect four or five wellheads per day, Duggan said ScanEagle can do an order of magnitude of that easily. Last year, ScanEagle was also flown over the massive wildfires in Oregon and California and Hurricane Harvey in Texas in the United States. ScanEagle collected and processed data on hot spot and fire line locations and disseminated up-to-date information to firefighters for their morning planning meetings. Duggan noted that ScanEagle can supplement manned firefighting fleets by “flying the gaps,” or operating during dense smoke conditions or at night, when manned aircraft typically are grounded due to hazardous flying conditions. He also said that ScanEagle can fly lower than manned spotter aircraft, beneath the altitude used by water bombers, to gather more precise information. Duggan said that very few private or parapublic users either have the budget or appetites to own their own ScanEagle systems; rather, the company provides turn-key solutions to these users, selling them the data from ScanEagle via hourly or daily rates. Going forward, he said, the company is focusing on software that will enable the vehicle to do more data processing onboard to “minimize the amount of data that needs to be passed around,” increasing reliability in “a certifiable way,” and bringing autonomy to the system that “can be trusted by the regulators,” even though ScanEagle is a robust and proven system with nearly 1 million flight hours. Beyond that he said, “These assets really start to show huge synergistic benefits to military and commercial organizations when one pilot can fly multiple aircraft. That is where the future is in this space.” Currently military and civilian authorities require that each vehicle be flown by a dedicated operator.